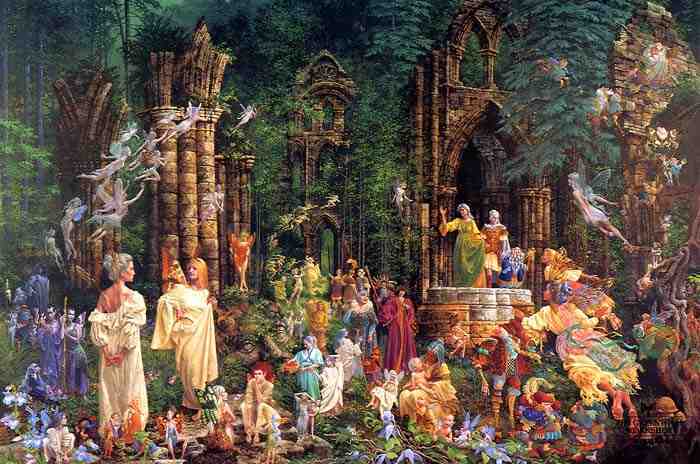 We feel it’s important for us to share with you today something about the Faerie Realm. The reality we exist in, the dimensional realm that we inhabit is directly infused with yours. If you were to take down that thin veil that is between your reality and ours you would see us everywhere at all times, surrounding everything. Imagine your world, your reality, that you experience every day and then imagine an entirely other world superimposed onto yours. We, as faeries, experience both your dimensional reality and ours at the same time. For us, there is no veil between our world and yours. For us, we coexist with you in a very deep, and real, symbiotic relationship with all of you. Once upon a time there was no veil for humans either. Once upon a time all of humanity and the faeries shared one reality. This was a very long time ago, and we don’t see the purpose in going over your history with you, but what we would like to impart to you is that there is a veil between our realm and yours that was placed by your ancestors many years ago. Truthfully, there are still pockets, or portals, on Earth where there is no veil, but they are hidden. We aren’t hiding anything from you, it’s just that most of you haven’t stumbled upon them yet or haven’t bothered looking for them. Having said that, you don’t really need to bother looking for them because, truthfully the veil is a lie. It doesn’t really exist. The veil between our realm and yours is an illusion that most of you were sold and have bought into. The illusion of the veil, or the separation between our realms, was created by your ancestors when they began disconnecting and separating themselves from Nature. It was created to separate humans from faeries. Quite simply, it was created to disempower you. If you could see us, or experience us, your lives would be so enriched and you wouldn’t have a need or want for anything. There are people over history, and even entire cultures and civilizations, who did not accept or buy into the illusion of the veil and who were able to experience their lives in relationship with us. There are a many of you today that have also realized the true nature of your reality and have had experiences with us, or have caught glimpses of us. We are excited and happy to say that there are many people being born during this time who have chosen to come here preprogrammed to be able to experience Earth without the illusion of separation between our realms, who are able to see and communicate with us on a daily basis. This will allow for many others to be awakened to the true nature of your reality. We would like for you to sit with this for a bit before we explain some more about reality. We hope you go outside today and take some deep breathes of fresh air.